It’s another torrential rainfall in the Houston area and your backyard begins to fill up. As you watch, your heart starts to race, you can’t take a full breath, and you know that at any minute you will get the shakes. What do you do? Take a deep breath. Tighten your muscles and slowly release them. Take another deep breath. These are some of the tips that might help prevent a full-blown panic attack – and they’re just a click away. In the wake of Hurricane Harvey, faculty and staff in the Department of Psychiatry and Behavioral Sciences at McGovern Medical School at The University of Texas Health Science Center at Houston (UTHealth) sought a solution to bridge the widening gap between the need for mental health care and access to it. 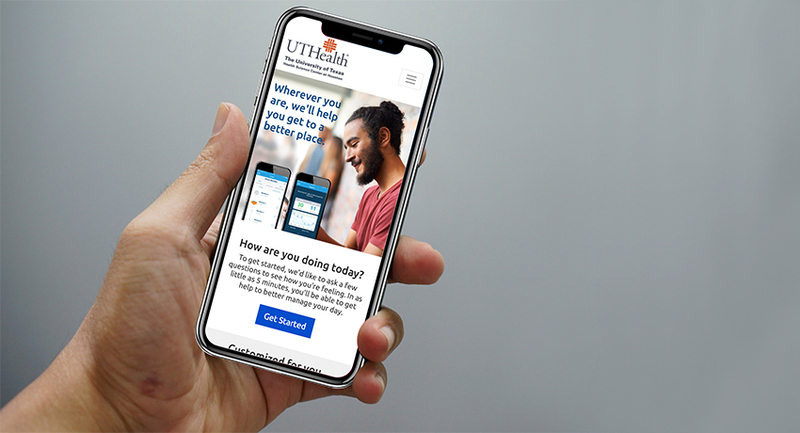 With funding from the Hurricane Harvey Relief Fund of the Greater Houston Community Foundation, a free digital cognitive behavioral therapy (DCBT) is now available from UTHealth. The evidence-based program, developed by Magellan Heath, includes modules for anxiety disorders, moderate depression, chronic pain, obsessive-compulsive disorder, substance use, and sleep difficulties. The program can provide helpful tips for people with limited access to mental health care, or in combination with therapy. MoodCalmer – Designed to help with mild to moderate depression, the four-session program helps people identify signs of depression, reverse thinking errors, and schedule pleasant activities. FearFighter® – Aimed at people with anxiety disorders, the nine-session program includes steps to reduce panic and phobia, which are rooted in fear. Exercises include tightening and relaxing muscles, diaphragmatic breathing, and “catching” your breath. OCFighter – Nine sessions include identifying triggers for obsessive-compulsive behavior, exposure and response prevention, and getting help for depression and disassociation. Restore® – Six sessions designed to improve sleep problems target four main areas: thoughts, habits, arousal, and consequences. Participants identify problem habits, learn about the relationship between sleep and emotional disturbances, and practice “applied relaxation” techniques. Shade – A 10-session program for people with alcohol or substance misuse, the program includes mood monitoring, identifying problematic thought patterns, and developing effective drug refusal skills. ComfortAbleTM – Chronic pain is addressed in seven sessions to improve comfort ranging from pacing physical activity to relaxation exercises to planning for future flare-ups. It also helps people change unproductive thoughts and behaviors. To access the program, go to UTHealth.OnToBetterHealth.com. For an appointment with experts from the UTHealth Trauma and Resilience Center who practice at UT Physicians Outpatient Clinic-BBSB, call 713-486-2630.